United Kingdom | April 30, 2018– STG Aerospace is delighted that Ruth Williams has joined the company as Head of Marketing. She will have a key role to play in developing and implementing a brand strategy aimed at raising global awareness of the company’s aircraft cabin lighting solutions and increasing market share across its entire photoluminescent and LED product range. Aircraft Interiors Expo, Hamburg | April 10, 2018– STG Aerospace is delighted to simultaneously announce the launch of the latest version of their liTeMood® LED lighting system for Airbus A320 and A330 aircraft, along with the first 2 launch customers – Small Planet Airlines and XL Airways France who will upgrade their A320/A321 and A330 fleets later this month respectively. The dynamic and configurable full colour, plug-and-play, programmable retrofit lighting solution sets the scene in an instant and can be customised to any scene or scenario, helping create a unique experience that passengers won’t want to forget. An extension of the proven feel and performance of STG Aerospace’s liTeMood®, the unique Airbus system offers fully customisable, animated scenes that can change post installation in just minutes via a patented infrared wand. As well as the choice of selection from over 16 million colours, the system offers the ability to incorporate bespoke scenes, from northern lights to sunrise and sunsets to more unique settings to celebrate national holidays. Available for retrofit on single and twin aisle Airbus aircraft, the cost-effective power saving system works with both classic and enhanced CIDS, installed in under 6 hours (A320) and requires no changes to aircraft wiring or control systems. Aircraft Interiors Expo, Hamburg | April 12, 2018– In response to a request from its long-standing client Icelandair, STG Aerospace has designed, developed and patented a powerful and simple saf-Tsign® product, introduced to upgrade dated Passenger Service Units (PSU), complete with a switchable Wi-Fi sign. As one of the first airlines to roll-out high-speed Wi-Fi connectivity across its entire fleet of aircraft, Icelandair turned to STG Aerospace to effectively communicate this major enhancement in the passenger experience on its fleet of Boeing 757 aircraft. Through a powerful combination of photoluminescent and LED technology, the new PSU lens removes the need to backlight the No Smoking icon by moving it to a central position and illuminating the command with blue glowing photoluminescence, ensuring the sign is always visible even in low light and dark conditions. Creating a switchable display on the left, now converted to LED, the No Smoking icon has been changed to a Wi-Fi icon, allowing airlines to manage the availability of the service and advertising to passengers that Wi-Fi is available on-board. Sigurður Ingi Ljótsson, Industrial Designer at Icelandair, said: “Our long-standing relationship with STG Aerospace made them a first choice for this PSU upgrade project. By changing the switched no-smoking symbol for a Wi-Fi available one, we can let passengers know in the day or night that Wi-Fi connectivity is available on our planes. In addition to the practical and aesthetic benefits, the new patented PSU lens is a lighter, simpler, retrofit solution that can be customised to provide effective on-brand messaging to all passengers on-board. To complete the modernisation process, STG Aerospace offers direct, filtered white LED’s to illuminate the sign and its latest square beam reading light. This is the first major retrofit win for STG Aerospace in the Asia Pacific region and the largest lighting retrofit contract that the company has been awarded. Selected on STG Aerospace’s ability to quickly deliver the programme in line with the airlines busy maintenance schedule, combined with the simplicity of installation, together made STG Aerospace the number one supplier for the large retrofit cabin lighting contract. “It has always been our endeavour to provide the best in-flight experience to our passengers. We are extremely happy with STG Aerospace’s ability to meet our tight timescales” said Arun Kashyap, Executive Vice President (Engineering), SpiceJet. “We are looking forward to enhancing the passenger flying experience on our aircraft and harmonise the look and feel of our cabin interiors of our existing fleet to achieve impactful brand differentiation and fleet commonality”. A customer of saf-Tglo® since 2005 SpiceJet will now combine both liTeMood® and saf-Tglo® systems to provide a total cabin lighting system that complements each other, resulting in satisfied passengers, increased wellbeing and reduced stress during the flight. liTeMood® has become the undisputed cabin mood lighting system of choice for operators of narrow-body Boeing fleets and is already delivering significant cabin transformations for numerous airlines in Europe, USA, Latin America and most recently Asia. United Kingdom | August 10, 2017– Aircraft cabin lighting specialist, STG Aerospace is increasing its capability to meet future demand for its aircraft photoluminescent floor path marking, emergency and informational signage and LED mood lighting products. This is very much driven by the company’s commitment to R&D at its Innovation & Engineering Centre in Cwmbran – a part of Wales that is fast becoming a dynamic aerospace hub. “The company’s vision and its global presence are the two reasons why I joined the team.” added Roger Tanner, Mechanical Design Engineer, who is primarily working on STG Aerospace’s innovative new LED cabin lighting product ranges. United Kingdom | April 25, 2017– STG Aerospace, a world leader in pioneering aircraft lighting technologies, is delighted to announce that it has secured FAA approval for the installation of its LED liTeMood® system on the Boeing 757 series of aircraft. Hamburg, DE | April 6, 2017– At the PAX International Readership Awards ceremony held last night, at the Radisson Blu Hotel in Hamburg, STG Aerospace was awarded winner of the ‘Best Cabin Interior Passenger Experience’ category with its revolutionary square-beam liTeMood® LED Reading Lights. Now in their 3rd year, the annual PAX Readership Awards offers the opportunity for the readers to vote for the industry’s most deserving players. Certified for Boeing 737NG and 757 aircraft types in March 2017, STG Aerospace liTeMood® LED Reading Lights are already in service with Titan Airways and Blue Air, and feature a unique square-light beam in place of the traditional circular beam, ensuring unrivalled passenger privacy. Hamburg, DE | April 5, 2017– STG Aerospace, a research-driven innovator of aircraft cabin lighting, is delighted to announce that Icelandair, has selected their latest saf-Tglo® blu photoluminescent floor path marking system for install on its new fleet of Boeing 737 MAX 8 and MAX 9 aircraft. Since its launch at the end of 2016, saf-Tglo® blu has already been awarded the prestigious title of ‘Best Cabin Innovation’ of 2016 by APEX, gained FAA and EASA approval across the majority of Boeing, Airbus and Embraer aircraft types and been retrofitted with several major airlines, including one of the world’s largest low-cost carriers as well as a major Boeing 777 operator. Furthermore, STG Aerospace is delighted to announce that it is soon to be added to the options catalogue for major OEM programs. Icelandair has already installed STG Aerospace’s green-glowing SSUL system across its Boeing 757 and 767 fleets, and its decision to install the latest evolution of saf-Tglo® on its latest fleet to enter service at the end of 2017 shows the airline’s commitment to deliver the highest possible standard of cabin experience to its passengers. AIX Hamburg, Germany | April 4, 2017– Aircraft cabin lighting specialist, STG Aerospace is delighted to announce that Romania’s largest airline Blue Air and leading charter carrier Titan Airways are the first airlines to install their revolutionary square-beam liTeMood® LED Reading Lights on their B737NG and B757 aircraft respectively. STG Aerospace has also secured EASA certification for both aircraft types. The liTeMood® LED Reading Light, an APEX 2016 awards finalist in the ‘Best Passenger Comfort’ category, is a quick-to-install drop-in replacement for the standard incandescent reading lights installed on B737NG and many B757 aircraft. Featuring patented photometric technology, liTeMood® LED Reading Lights create a more restful, private space with a greater sense of personal control by introducing a unique square-light beam in place of the traditional circular beam. This square-beam distributes light precisely and evenly across the seat and tray table, improving visibility and eliminating hot spots and light spill to neighbouring passengers. Meanwhile the high CRI (Colour Rendering Index) and high R9 (High Quality Red pigment) means not only is magazine text more readable but that inflight meals appear more enticing and on-board merchandise more attractive for purchase. It also dramatically reduces the glare on tray tables, eBooks and tablets, working for all passenger types. Operational benefits include a dramatic improvement in reliability, by over 10 times, and simple installation meaning a complete aircraft can be fitted out in just a few hours. With thousands of passengers on-board Titan Airways and Blue Air aircraft benefiting from their new reading experience from liTeMood®, and further airline installations scheduled for this year, the enhancements in passenger comfort of this simple upgrade are obvious. United Kingdom | March 29, 2017– STG Aerospace, the innovative aircraft cabin lighting company, is delighted to announce that it has secured FAA approval for saf-Tglo® blu across the majority of Boeing, Airbus and Embraer aircraft types. Combining critical safety performance with enhanced interior aesthetics, saf-Tglo® blu is the world’s first blue glowing photoluminescent emergency floor path marking system. Recently awarded the prestigious title of ‘Best Cabin Innovation of 2016’ by APEX (Airline Passenger Experience Association) it will soon to be added to the options catalogue for major OEM programmes, this approval allows airlines following FAA regulations to install the system. saf-Tglo® blu will transform how airlines accomplish emergency way guidance, for the first time enabling this critical safety system to complement the aircraft cabin aesthetics. With the same choice of base colours to match the carpet and interior colour scheme as the original saf-Tglo® range, saf-Tglo® blu introduces a soothing blue glow in place of the traditional green glow. This works with an airline’s branding and the latest LED lighting installed in modern aircraft. saf-Tglo® blu is based on the proven technology of the original and market-leading saf-Tglo® photoluminescent range and is available in the company’s SuperSeal UltraLite® (SSUL) system, which is the lightest, narrowest and highest performing photoluminescent system available. The simplicity of its design, its 100% reliability and being maintenance free with no life limit ensures that airlines can make significant operational savings too. STG Aerospace will be showcasing saf-Tglo® blu on its stand 6A28 at the Aircraft Interiors Expo in Hamburg on 4th – 6th April 2017. Cwmbran, United Kingdom | March 8, 2017– STG Aerospace, a research-driven pioneer in aircraft cabin lighting, held an Open Day on 7th March at its Innovation & Engineering Centre on the Llantarnam Industrial Park, Cwmbran. 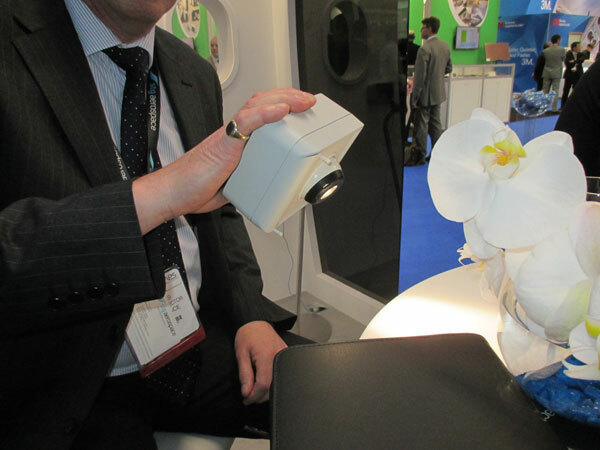 The tour also included demonstrations of the latest product developments from STG Aerospace. 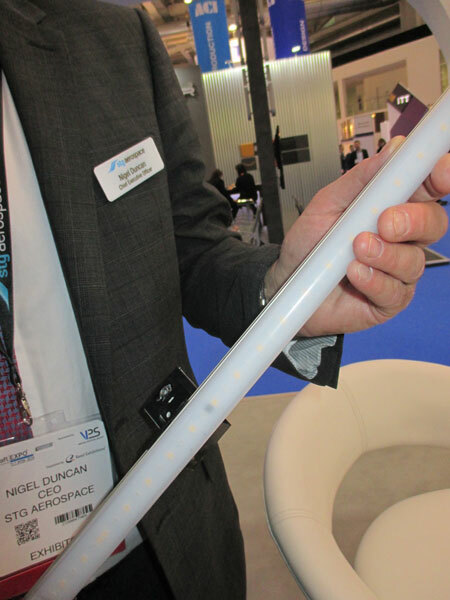 These included the company’s new LED reading light, part of its liTeMood® range which, with its patented square light pattern, minimises the light spill onto neighbouring seats and helps give passengers a sense of control over their own environment. Also being demonstrated was saf-Tglo® blu, the world’s first ever blue-glowing photoluminescent emergency floorpath marking system which creates a more calming ambience and has already won a prestigious APEX Award for Best Cabin Innovation. Welcoming the news, Economy Secretary Ken Skates said: “STG Aerospace is a recognised market leader in its field and has a quite remarkable global reach, exporting worldwide with its products acknowledged as industry standards. This is a considerable achievement and STG Aerospace is a very welcome addition to the dynamic aerospace sector we have in Wales. “I am delighted Welsh Government support helped the company establish its new centre in Wales and that it has created significantly more jobs than was originally anticipated which is great news. STG Aerospace’s success and rapid growth is reflected by a range of global patents and the number of major industry awards it has received, including winning the Queen’s Award for Enterprise on four separate occasions. United Kingdom | November 30, 2016– STG Aerospace, the pioneering aircraft cabin lighting specialist, is delighted to announce that it is expanding its global sales team with two new key appointments. The new Regional Sales Managers, Robert Keepers, based in Dallas TX and Theresa Härtel, based in Germany, will join the US and EMEA sales teams respectively. Before taking up his new role, Robert worked for Panasonic Avionics Corporation advancing in a number of roles since first joining the company in 2000. Most recently, as Marketing Account Manager Robert worked directly with airlines in Central/South America, coordinating the promotion and installation of the company’s in-flight entertainment systems. A graduate from New Mexico State University, Robert holds a BBA degree in Marketing and Management and is multi-lingual. Theresa will be joining the company from UTC Aerospace Systems where, as Product Sales Manager – Europe, Middle East and Africa, she was responsible for initiating and leading sales campaigns for the company’s Interiors Business Unit. Prior to that, she worked for one of UTC’s subsidiaries, Goodrich Lighting Systems GmbH, as Program Manager – Worldwide Aftermarket. Theresa holds a Bachelor of Law degree from the University of Applied Sciences, Bielefeld, and has been certified as a Project Manager by the Chamber of Industry and Commerce, Bielefeld. A Tier 1 or Tier 2 OEM for virtually every major aircraft manufacturer, STG Aerospace also counts hundreds of airlines, lessors and MROs among its customers. Its products are currently installed in over 10,000 aircraft worldwide, representing one third of the world’s passenger fleet. United Kingdom | October 19, 2016– STG Aerospace, the market leader in aftermarket LED cabin lighting solutions, is delighted to announce that South African regional feeder airline Airlink has awarded them a Purchase Order to retrofit 12 of their aircraft with their drop-in liTeMood® LED lighting system. United Kingdom | May 27, 2016– STG Aerospace, a leading aircraft cabin lighting OEM, is delighted to announce that prestigious British charter carrier Titan Airways is the latest airline to install STG’s market leading liTeMood® retrofit LED mood lighting system on its Boeing 757 aircraft. With the first retrofitted aircraft installed during a cabin re-configuration earlier this week and already in commercial service, its sister aircraft will be modified later this summer. This adds to the increasing number of airlines across Europe, North and South America that have selected liTeMood® – making it the undisputed system of choice for operators of narrow-body Boeing fleets looking for a best in class but cost-effective solution for upgrading dated cabin lighting. liTeMood® represents the next generation in simple, beautiful and easy-to-install retrofit LED mood-lighting aimed at significantly improving passenger comfort and reducing maintenance costs. The blue/white bi-colour system creates a calming and fresh cabin ambience by delivering outstanding quality and consistency of light throughout the cabin. Whilst “Plug and Play” can be an abused term in the world of aircraft modifications, liTeMood® is a genuine example of a truly simple upgrade requiring no aircraft modifications, using all the existing wiring, mounting points, connectors and control panel. The system is typically installed in under five hours, independent of and with minimal impact to any other cabin work making it straightforward to accomplish during a short stop. FAA and EASA approved, liTeMood® is significantly more reliable than traditional fluorescent lighting systems, reducing ongoing maintenance and operational costs, and offers both a 36kg weight reduction and at least 50% reduction in power consumption, substantially increasing both fuel efficiency and electrical efficiency. Alastair Willson, Director of Titan Airways said: “At Titan Airways we are always striving to improve the in-flight experience and the investment in mood lighting is one more enhancement of the Titan Airways product. We selected STG Aerospace’s liTeMood® system due to their huge experience and expertise in upgrading Boeing 737 and 757 aircraft with LED cabin lighting. The simplicity and speed of installation was exactly as described and the transformation of the cabin was breath-taking. The latest investment follows installation of a state-of-the-art wireless in-flight entertainment system across Titan’s Boeing 757 and Airbus A320 fleets last year”. Nigel Duncan, CEO of STG Aerospace, commented: “We are delighted that Titan Airways, one of the most prestigious charter airlines in the world, has selected liTeMood® for its Boeing 757 fleet. The installation, carried out at short notice the weekend ahead of a VIP charter operation, was an excellent partnership between STG and Titan engineering teams and is further evidence that liTeMood® has become the clear choice for operators of Boeing narrow-body aircraft”. One of the more interesting meetings at an IFE show is always one with the folks at STG Aerospace and especially with Nigel Duncan CEO. Why, you ask? Because Nigel is probably the best salesperson we have ever seen… at the least, he knows his products as well as anyone in his company. But more importantly, he as excited about them and when we visited, we heard and discussed their new passenger oriented liteMoodLED Cabin Lighting product, the latest in photoluminescent floor path marking saf-Tglo blu, and STG liteMood, their new LED strip lighting that replaces fluorescents in planes. Lets start off with one of the most amazing passenger lights we have ever seen – STG liteMood passenger cabin reading light. As we all know, the light over a passenger seat that can be turned off and on by passengers normally describes conical light beam that illuminates a seat and can be adjusted to adjust the light on your tray table or the book you are reading. The problem is one of filament illumination. First the shape (bulb) is circular and diffuse light travels beyond your use and usually illuminates more than the table. Further, it does that because to get enough light for your use, the conical beam is bigger than needed. This means that your light, and all the others, use more power and illuminate more than one passenger, just to solve the illumination problem. 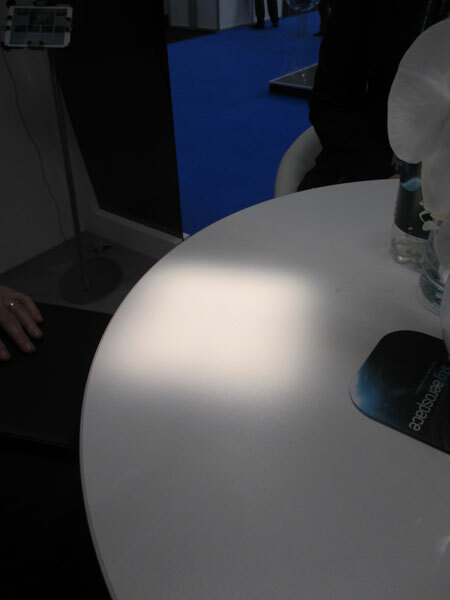 Nigel’s team decided that they could do a better job and did just that – STG made an LED light that delivers a rectangular light beam illuminating only one table top. More importantly, they are using LEDs, which can get near to the color of solar light – better on the eyes and limit brightness. The light itself fits in existing fixtures, uses one LED in a special lamp-sized replacement and works like any other bulb but does a better job, at less power. Don’t believe us, check out the demo box picture (the light itself just replaces ones in the plane) and see for yourself: STG Aerospace gives passengers a defined private space with its new passenger centric LED reading light. Designed initially for the B737NG, we expect to see a lot more planes with this product. 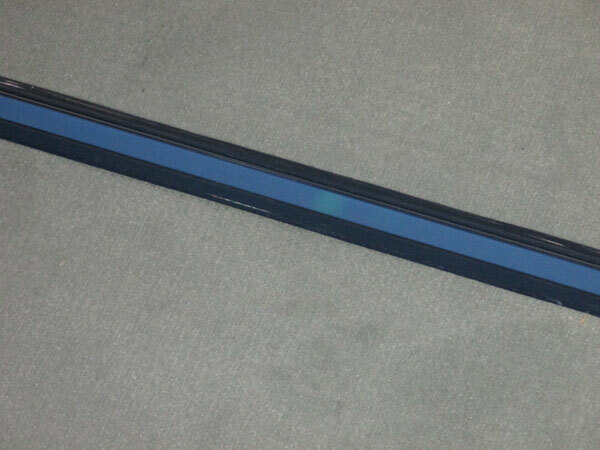 Next, we saw the saf-Tglo product, a blue photoluminescent floor path living strip that delivers a blue shift, different from green strips that abound today. While aesthetic are on value in this product, their brochure notes that, “In addition to optimizing the glow colour, saf-Tglo blu provides a wider, brighter colour palette in ambient due to it’s whiter base colour.” Be sure to see it for yourself! Finally, Neil Thomas told IFExpress: “Quite frankly, any light in the cabin is one we are looking to improve,” and thus he gave a perfect introduction to the last new product we saw, the new LED mood lighting system using LED strip lights that replace fluorescent lights and deliver an improved onboard experience. Said Nigel; “STG is trying to do things with lighting that collectively make a big difference.” Importantly, the lighting on an aircraft can affect the mood of passengers and STG realized the need for a ‘more aesthetically pleasing’ light solution and eliminate the sub-visual flickering that fluorescent lights give off. Mr. Duncan noted a Manchester University study that shows it is not the variety of colors that impacts passengers, it is the depth of color and saturation levels – features designed into their lighting solution. The liteMood LED cabin lights are presently installed on B757 and B737NG aircraft and have been flying for 16 months now. Since some 96 percent of flying aircraft today utilize fluorescent lighting the market looks quite healthy but because the STG provides a strip kit, the airlines can do the modification themselves. The company has outlined its long-term aviation broadband roadmap to ensure that rising demand for fast, reliable and global passenger in-flight connectivity is met for the next five years and beyond. The launch of Inmarsat’s Global Xpress (GX) Aviation solution this year (Dec. 2016) creates the world’s first high-speed passenger in-flight connectivity solution with seamless, end-to-end global coverage, delivered through a single operator. Initial airline customers include Lufthansa, Singapore Airlines and Jazeera Airways. In all, they are running some 26 STC programs in parallel! Inmarsat noted: “The GX network, which entered commercial service in December 2015 and currently includes three powerful Ka-band satellites, will provide the international bandwidth capacity needed to meet existing and near-term demand from airlines. As part of the aviation broadband roadmap, it also provides a global coverage underlay that will be built upon to meet future demand.” We note that GX is Ka Band and it employs spot beams. From their Newsroom: “The companies will manufacture 0.6 to 2.4 metre aperture terminals to deliver up to 50Mbps downlink speeds.” We also note that this should replicate data rates like ground based mobile applications. Also, keep your eye on future GX applications that support the new, flat Kymeta antenna! Inmarsat has already committed to a fourth GX satellite, which is completing construction and testing by Boeing and will provide additional network capacity. It has also awarded Airbus Defence and Space a contract to build the first two satellites for its sixth-generation fleet, the first of which is scheduled for delivery by 2020. Uniquely for Inmarsat, the new fleet will feature a dual-payload, with each satellite supporting both Ka-band and L-band services. Based on current services and demand, the Ka-band co-payload will augment the capacity of the GX network over busy air routes and regions, while the L-band capacity supports a new generation of aviation safety services. Launch customer, Lufthansa, will install and go into service 3Q 2016 on an A320. Another vital component in the roadmap is Inmarsat’s European Aviation Network (EAN), which will be the first aviation passenger connectivity solution across European airspace to integrate an advanced satellite network and LTE-based ground network; the latter will be operated by Deutsche Telekom. Aircraft will switch automatically between satellite and terrestrial connectivity using an onboard network communicator for optimal service delivery. Also, Inmarsat, has signed a Heads of Terms (HoT) agreement with Beijing Marine Communication & Navigation Company Ltd. (MCN), which will lead to the creation of a joint venture (JV) to provide aircraft cabin and cockpit connectivity solutions in China’s fast-growing commercial aviation market. The Inmarsat services that would be provided through the JV include Global Xpress (GX) Aviation and SwiftBroadband-Safety (SB-S). The final agreement is expected to be signed later this year. Note: SB-S is a next generation cyber secure flight deck communication platform, enabling airlines to meet the ICAO mandate for sub-15 minute tracking of all aircraft, Civil Aviation Authority of China (CAAC)’s four-minute mandate, Automatic Dependent Surveillance and electronic flight bag updates. Combining L-band satellite connectivity with advanced avionics, it delivers speeds 10 times faster than existing Classic Aero services to provide airlines with cockpit communications for the digital age. “Inflight operates the entertainment consoles for various airlines, including American Airlines, which was added to the lawsuit previously. Universal alleges that Inflight did not have proper licenses to play Universal Music, especially on international flights where there may not be a single licensing body to authorize the use of music. “Then in November 2013 the label suddenly sent them a cease-and-desist letter, which they claim has interfered with their contractual relationships with airlines. Last week’s BUZZ picture was incorrect… please note we pictured Ms. Agnieszka Jacquemot with Sara Pepic’s quote? Thank you, Alexander Preston, as you win the IFExpress prize – your name in print! Also, Web Barth can be reached as follows: webbarth@vts.global – Sorry Web, didn’t know there was a ‘.global’ on the web. And lastly, On July 15, 2016, Boeing will celebrate its’ 100th birthday. Hamburg, Germany | April 6, 2016– Eastern Air Lines, the iconic brand that was synonymous with air travel in the last century, is back in the air, flying with STG Aerospace’s LED mood lighting system, liTeMood® on it’s 737NG aircraft. The re-born carrier, which is based alongside STG Aerospace at Miami International Airport, has been operating twice-daily flights between Miami and Havana since May 2015 and has other Latin American destinations on the horizon. Becoming the latest airline to install the FAA and EASA approved LED mood lighting system, Eastern Air Lines selected liTeMood® on the basis of its capability to improve the passenger experience through the on-board quality and consistency of light. With its unique, patented wireless programmability function, lighting levels can be easily tailored to create the exact aesthetic ambience that the aircraft’s operators require. In addition to improving the overall comfort within the cabin, liTeMood® offers up to a 40kg weight reduction and a further 70% reduction in power consumption, significantly increasing both the fuel efficiency and electrical efficiency on aircraft. STG Aerospace’s liTeMood® is more reliable than original-fit fluorescent lighting systems, and reduces ongoing maintenance and operational costs. Complementing its liTeMood® LED mood lighting system, STG Aerospace offers a range of liTeMood® LED ancillary lighting solutions which work together to create a uniformity of colour throughout the aircraft cabin. Hamburg, Germany | April 7, 2016– STG Aerospace, the pioneering developer of innovative aircraft cabin lighting, is delighted to announce that is has been granted Design Organisation Approval (DOA) status by EASA (European Aviation Safety Agency). Hamburg, Germany | April 6, 2016– A pioneering developer of innovative aircraft cabin lighting, STG Aerospace is delighted to announce the launch of its new ancillary lighting products within its liTeMood® product range. Successfully installed and currently in service on Air Europa Boeing 737-800s and with a backlog of customer orders for delivery through April, the suite of LED plug and play ancillary lights are a popular choice for airlines currently flying with STG Aerospace’s liTeMood® mood lighting system, to complete the homogenous, controllable and uniform lighting environment throughout the cabin. Reflecting its holistic approach to cabin lighting, STG Aerospace has carefully designed the ancillary range to deliver a superior consistency of light throughout the cabin while enhancing the passenger experience during the boarding, in-flight and disembarking process. It also provides for an enhanced working environment in the galleys and aisles for the flight crew. A direct LED replacement for the incumbent T5 fluorescent tube, the LED replacement has been designed with passenger safety in mind. Located directly above the entry doors and ceiling of the aircraft, these low profile LED units are designed for an easy retrofit to replace the incumbent light/ballast. Featuring a high CCT (Correlated Colour Temperature), the lighting is designed to create a modern perception of the cabin, from boarding through to disembarking. Designed to work in harmony with the liTeMood® LED mood lighting system, these aftermarket replacement lenses create a uniformity of colour throughout the cabin by restoring old yellowing lenses back to their original state. In late 2015, Air Europa selected liTeMood® for the retrofitting of its fleet of 737-800s in order to create the same passenger experience as that provided on their recently delivered 787s. In addition, the new liTeMood® Over Wing Exit lights together with the Forward & Aft Entry Lights have now been installed on four of the airline’s 737s. United Kingdom | April 5, 2016– Aircraft cabin lighting specialist, STG Aerospace has re-defined standards in passenger privacy, comfort and visual experience with the launch of its highly innovative liTeMood® LED reading light. liTeMood® LED reading lights are an affordable plug and play replacement for Boeing 737 NG incandescent reading lights. The passenger centric lighting units feature a unique patented photometric design that delivers a square light pattern which precisely defines the individual passenger space, while preventing the inconvenient light spill onto neighbouring passengers. In addition to improving the overall comfort in the cabin, liTeMood® LED reading lights offer unparalleled levels of performance and are over 10 times more reliable than incandescent lights, and offer an 80% power reduction to increase the aircraft electrical efficiency. Designed to reduce the glare on tray tables, eBooks and tablets, liTeMood® LED reading lights have been designed to optimise the retail environment. They feature a multi-phosphor LED with a high CRI (Colour Rendering Index) in the excess of 95 which renders colours more vividly, making magazines more readable, inflight meals more enticing and on board merchandise more attractive for purchase. The new range of STG Aerospace’s innovative aircraft cabin lighting products will be on display in a life size model cabin at the Aircraft Interiors Expo in Hamburg between 5th – 7th April – stand 6B41. These new products will complement STG Aerospace’s existing range of innovation cabin lighting products: liTeMood®, saf-Tglo® and saf-Tsign®. STG Aerospace believes it is important to understand the total interaction of all light sources to provide an integrated lighting environment, one that delivers an enhanced passenger experience, increased customer loyalty, a strong airline brand identity and the optimisation of the cabin as a retail environment while still ensuring full compliance with all safety regulations. 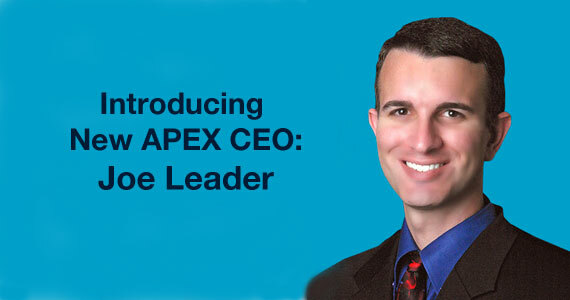 Meet Joe Leader, New APEX CEO! IFExpress: Please give our readers your feelings about the importance of technology for future cabin upgrades in entertainment and communications. Any examples? Leader: Future cabin upgrades in entertainment and communications will center upon automation and individualized personalization. Airlines have an incredible wealth of data about their customers to provide more individualized service. In-flight entertainment and connectivity solutions provide an amazing opportunity to further enhance passenger experience while boosting airline ancillary revenue. Google recently publicly presented an IFE mock-up. Their philosophy is one of answer, anticipate, and enable. That aligns perfectly with my philosophy of enhancing passenger experience via individual passenger preferences. Delta also unveiled their hand-held solution for flight attendants that shows all key information about every passenger. Advances will allow passengers to be remembered so that any charges for Wi-Fi, their favorite drinks, and food. IFExpress: At this time, how do you see APEX as a ‘positive force’ in affecting the improvements you noted above? Leader: APEX has been a steadfast airline passenger experienced focused association for nearly 40-years, but we need to shift gears to a thought-leadership organization that quickens the industry. I have listened to airlines, suppliers, service companies, and studios starved for common standards in our areas of responsibility. We will provide them as APEX bears the highest responsibility to advance these causes. Standards hasten industry adoption of new products. Taking proactive interaction now will make certain that in-flight entertainment does not become the Android Auto versus Apple CarPlay type competitive environment. I should not have to check device compatibility when I purchase my car or airline seat. Airline passengers should be able to leverage any smart phone and smart device with their airline of choice in the future. APEX holds an educational responsibility to enlighten our airlines on how to maximize ancillary revenue in a connected world that places the highest value on insights and returns. Finally, APEX should serve as an educational force for its supplier members so that their steps are more surefooted as they advance. IFExpress: Portland, Oregon APEX is near, is there a message you have for the attendees? Leader: We are entering an incredible age renaissance in passenger experience. My fellow CEO at A4A recently highlighted that airlines are spending half of their profits on enhancing passenger experience. APEX will provide the education and technological bridge to more quickly advance our $10 billion a year upgrade industry alongside the billions more in new aircraft passenger experience purchases. With more than 3500 attendees for APEX EXPO, there is no better venue in the world for advancement. We only allow members into EXPO that have been fully vetted. It stands as an appointment-driven show focused upon results. As our industry flies forward, APEX will serve as a beacon to maximize return on investment for all of our members and airlines. Lastly, we strongly encourage our readers to introduce themselves to Joe at the APEX Conference in Portland – we think you are going to like him. We also note that the world of inflight entertainment is changing, as he eloquently notes in his short interview. Undoubtedly, we think it is going to be a real interesting challenge to develop entertainment and connectivity solutions when today’s passenger brings a big part of the technical connectivity solution onto the plane. APEX may have just gotten it right – the industry will need a new ‘Leader” to adapt to the new environment. 1. 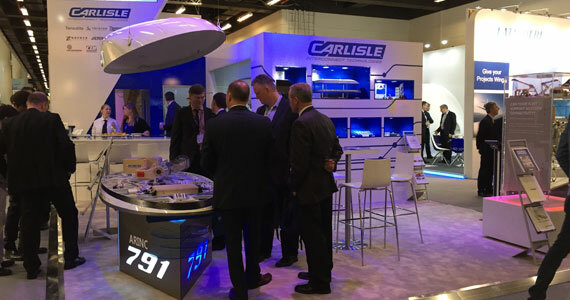 Carlisle – On the heels of the Paris Air Show in June, the launch of the FlightGear Ka/Ku Universal Installation has generated a flood of interest from OEMs, connectivity providers and airlines alike. 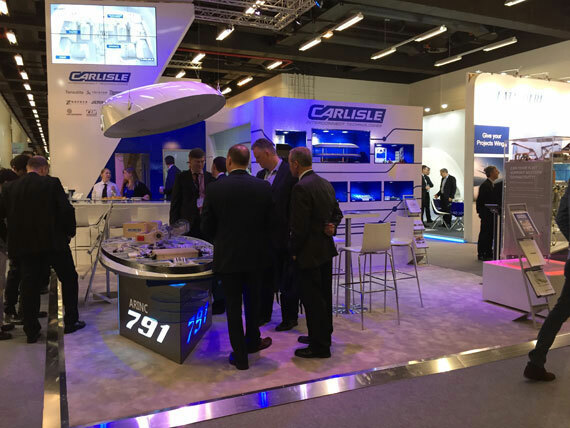 Carlisle Interconnect Technologies (CarlisleIT) has partnered with Saint Gobain Performance Plastics to design and engineer an industry first and is proud to present the only end-to-end ARINC 791 solution for Ka-, Ku-, and Tri-band SATCOM installations. Its installation made simple; by providing a platform-independent and system-agnostic ARINC 791 solution, CarlisleIT and Saint Gobain are helping airlines and system providers improve their speed-to-market and deliver enhanced next generation SATCOM connectivity to today’s airline passengers. This robust and versatile package contains all of the components required for either retrofit or forward-fit installations on large or regional jet aircraft. Installation fittings are adjustable to cover the complete range of aircraft frame spacings while optimizing the interface loads to the fuselage. A variety of available radomes tuned to Ka-, Ku-, or Tri-band frequencies fit interchangeably on the same adapter plate. Adapter plates customized to use existing radomes fit interchangeably on the same fuselage structural fittings. Aerodynamic fairings follow the fuselage curvature for each aircraft model without requiring large installation doublers, sealants, or excessive modifications to the aircraft skin. The design creates easier maintenance inspections, longer inspection intervals and lower long-term cost of ownership. Conformance to the ARINC 791 standard also helps future-proof the installation and makes upgrading to next generation multi-axis or low profile antennas easier and faster with commonality of key components across entire fleets. CarlisleIT’s booth at the APEX Expo at the Oregon Convention Center (September 29-October 1) will feature a flight ready display of the Ka/Ku Universal Installation. Visitors to the booth will have the unique opportunity to discuss system options and sketch customizations on an adapter plate with a team of technical experts. Let’s un-complicate things. Visit Booth 1405 at APEX Expo and let CarlisleIT help you do just that. 2. APEX – APEX sent us a list of Opening day speakers (Sept. 28) and they include new APEX leader – Joe Leader, Sandy Stelling – Managing Director Customer R & D, Alaska Airlines, Werner Lieberherr – CEO, B/E Aerospace, Rainer von Borstel – CEO, Diehl Aerosystems, Devin Liddel – Principal Brand Strategist, TEAGUE, Rajan Datar – Presenter, BBC World News. 3. IFPL – In Portland, you might also want to see the following at IFPL’s booth 1408: “Cost and reliability have been a main focus in our new Breakaway jacks series which delivers a revolutionary cost neutral solution for both the jack and the headset, whilst providing high availability as it leverages our proven and popular Long Life audio jacks plus our new MagSignal technology which prevents broken headsets and jacks with our MagSignal connector. The module is fully compatible with existing headset connector types and our Long Life jack is tested to over 100,000 insertions.” We didn’t know: “Research shows that up to 10% of headsets coming off long-haul flights are not re-usable due to damage, which often results with broken pins left in the sockets rendering the IFE experience useless.” Check it out. 4. Pre-show, and while you are online, check out the New York Times bit about Portland sent to us by a fan. We note the video in the link and it should give our readers a rough idea what Portland is all about. As one speaker noted: “Portland is real serious about being casual.” Check it out! Lufthansa Systems presents new Lido/eRouteManual product release – A mobile updater will allow wireless data updates to mobile devices, enabling pilots to update their Lido/eRouteManual digital navigation charts anytime, anywhere. This feature is part of the new product release which Lufthansa Systems unveiled at the annual Lido/Navigation User Conference in Zurich. Various Lido navigation solutions are in service worldwide with approximately 100 airlines, around 50 of whom have sent one or more delegates to this year’s conference. The new mobile updater represents a further, significant simplification for using the digital chart solution on mobile devices. STG Aerospace has secured a U.S. Federal Aviation Administration Supplemental Type Certificate (STC) for its liTeMood Light-Emitting Diode (LED) cabin lighting system on the B737NG. If you are wondering how Airbus will assemble A320’s in Alabama, watch this movie. Worried about Internet security on the go? Check out Invisibox. Stay secure online on the go. The device is a “sponsored Kickstarter campaign” and will be available starting Feb. 2016 for backers. It features masked Tor traffic, GeoIP, exploit vulnerabilities cancellation, unique device passwords, add blocking, and a free VPN. It also will charge your phone – get in line, it’s about the size of your phone. “The Martian’ is one of the year’s best movies. Told you so! A special IFExpress Adios to Ken Lew (UAL, SONY, Rockwell, Boeing, Thales) who retired recently and who will probably be on his way to a European vacation when you read this. Ken wanted to say goodbye to his friends in the IFEC business at APEX but will not return till after the event has finished. Or, wish him the best yourself via email – ken_lew@ieee.org, and you might like read this ‘Olympic Tale’ from his IFE history.